Some delicate colour blocking for the birthday party of one of my all time bf's and neighbour. I love the Massimo Dutti shirt;-) I really love the mix between blue and green. ! Nice outfit my dear! wauw, wat een onwijs mooi kleurencombinatie! Die blazer & de blouse, jealous! lovely outfit, I love colour blocking!!! Sooo pretty!! I love the combo of colors you are wearing! Beautiful outfit! 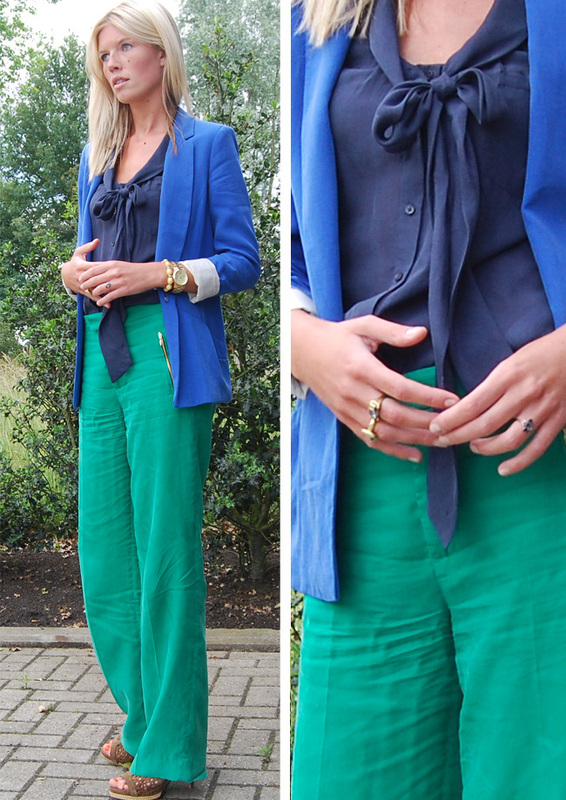 Love the blazer and the pants! Nice colorblocking! I wanted to buy the same pair of trousers, but they didn't suit me at all. On you, on the other hand, they look divine! The color combination is absolutely gorgeous! perfect outfit! Wow, perfect look! I like everything! I love how drapey and soft every piece looks! Beautiful! Great look to wear to a party! Love it, the linen pants look so comfy, and you can't go wrong with a bowtop!